Defence minister Niramala Sitharaman pays visit to Congress MP Shashi Tharoor in a hospital. 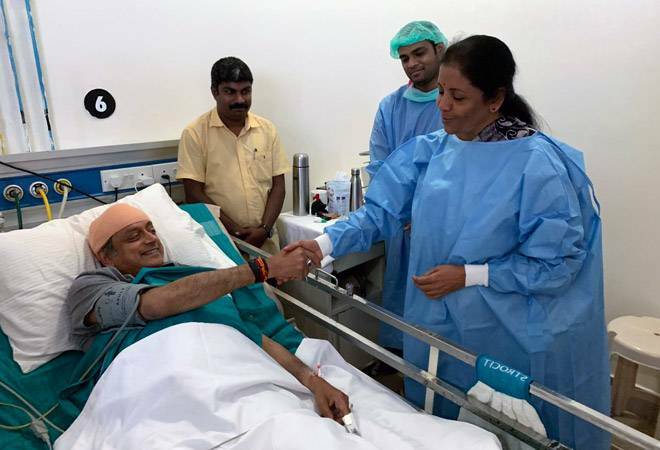 Defence minister Niramala Sitharaman paid a visit to senior Congress MP Shashi Tharoor, who was hospitalised in Thiruvananthapuram after he sustained a head injury while performing a ritual at a temple. The Congress leader was so overwhelmed by the BJP minister's visit that he shared he took to Twitter to share his sentiments. "Civility is a rare virtue in Indian politics - great to see her practice it by example!" he said. On April 15, the Congress leader suffered head injuries when the hook of a weighing scale came off and its iron panel hit his head while performing 'Thulabharam' ritual at a temple in Thiruvananthapuram. The accident happened when Tharoor, sitting in the weighing scale, was waiting to see the 'Deeparadhana' (aarti) being performed at the sanctum sanctorum," said MLA Sivakumar who also accompanied Tharoor during the ritual. The 63-year-old MP also suffered a minor leg injury in the incident, which occurred at a Devi temple here. Monday was the Malayalam New Year day ('Vishu'). Tharoor performed the ritual by offering sugar equal to his weight in the morning before embarking on his election campaign. "Due to the flow of visitors, he was shifted to ICU now from the observation ward," the official said adding that the MP has to undergo a repeat scan. Television channels showed yesterday, the former union minister getting into a car with a bandaged head and waving to onlookers wearing a blood-stained kurta. 'Thulabharam' is a Hindu ritual in which a person is weighed against a commodity such as flowers, grains, fruits and similar articles in temples and the equal value or quantity is offered as a donation. After the incident, Tharoor's election programmes for the day got cancelled.